Making a beautiful cake is an art, and, like any art, it takes a great deal of innate talent and lots of practice to create. However, regardless of artistic inclination, everyone should be able to learn how to produce a great tasting cake by following the right recipe. This recipe for chocolate cake has a strong, but not overwhelming, chocolate taste that will put a smile on any chocolate lover. The chocolate used in this cake is fairly important. Dutch processed chocolate has a different alkalinity than unprocessed chocolate and cacao powder, so these ingredients cannot be easily interchanged in this recipe. Use a high quality eating chocolate (such as Dagoba) and pure cacao powder. Assemble the ingredients for the batter: 8 oz. (225 g) unsalted butter (softened), 1-1/4 cups (295 g) drinking water, 3/4 cup (105 g) all-purpose flour, 3/4 cup (85 g) cake flour, 1-1/2 cup (300 g) dark brown sugar, 3 large eggs, 1/4 cup (20 g) pure cacao powder, 2 oz. (55 g) 70% cacao dark chocolate, 1-1/4 tsp. 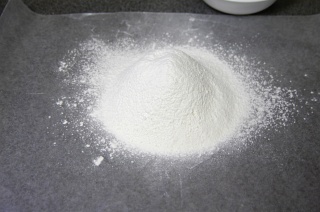 baking soda, 1/4 tsp. table salt, 1/2 cup (115 g) sour cream, and 1 tsp. (5 mL) pure vanilla extract. We'll also need two 9-in. round cake pans (or 3 8-in. 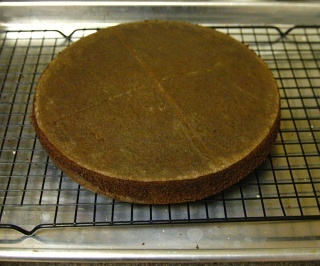 round cake pans for a taller three-layer cake) and two sheets of parchment paper. Place a cake pan over each sheet of parchment paper. 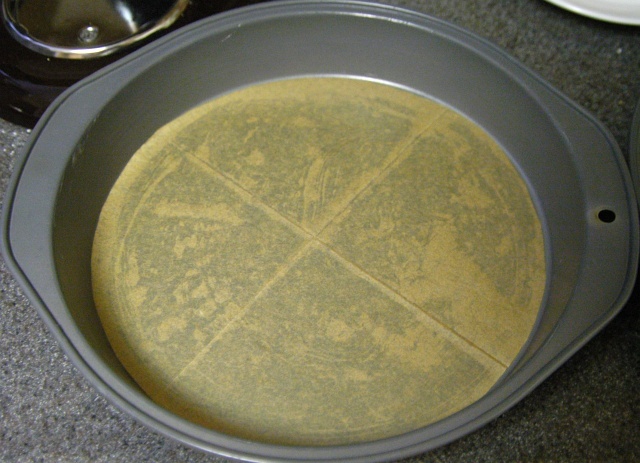 Using a pencil, trace a circle around the base of the cake pan. 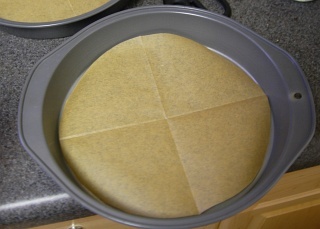 Fold the parchment paper in half so that the circle forms a half circle. Then fold in half again to form a 90° arc. Cut along this curve to form circles of parchment paper. 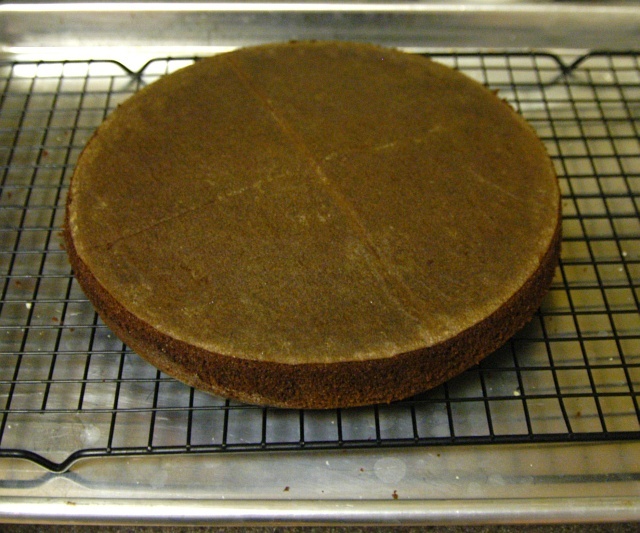 The paper should fit perfectly into the bottoms of each cake pan. 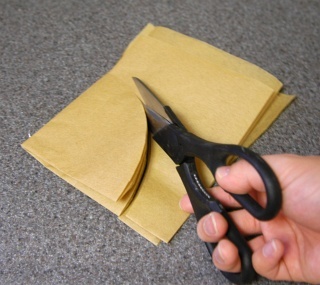 Using this folding and cutting technique is a bit simpler than attempting to neatly cut and entire circle. Line the bottom of each pan with the circles of parchment paper. Start by sifting the two flours, baking soda, and salt together. I like to sift them onto a sheet of wax or parchment paper because the paper can then be picked up and the contents poured out in an easy to control manner. 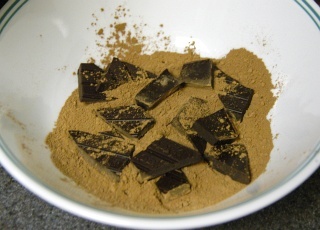 Break up the chocolate into 1/2-inch (1 to 1.5 cm) squares and combine with the cacao powder. 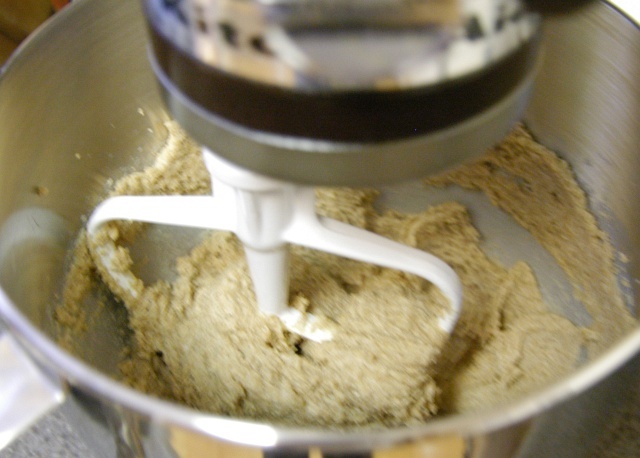 Once the flour has been sifted and the chocolate melted into boiling water, cream the unsalted butter with a standing mixer equipped with a flat beater. 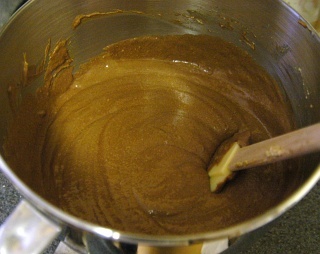 Add the dark brown sugar and mix until butter and sugar are evenly mixed. Scrape down the bowl with a spatula. One at a time, add the eggs and beat on medium-high until fully incorporated. Mix in sour cream and vanilla extract. Scrape the bowl down. 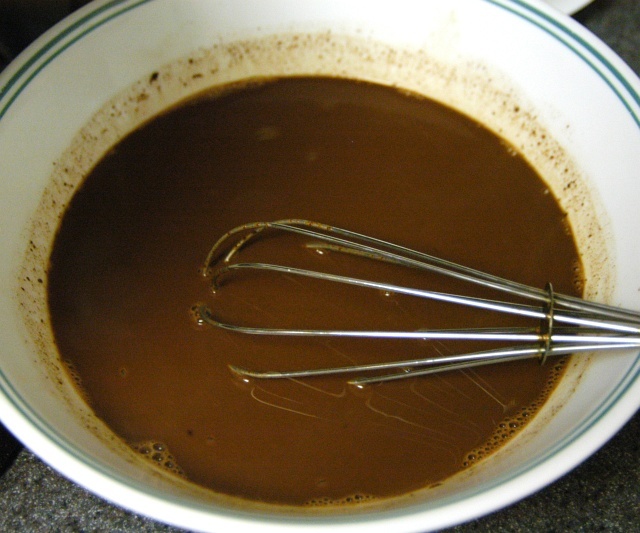 On low speed, mix in a third of the flour mixture followed by half of the chocolate liquid. Repeat with another third of the flour and the rest of the chocolate. Finally, mix in the last third of the flour. Stop the mixer once the batter has just combined. Bake both cake pans in a 350°F (175°C) oven on a rack set to the center position for 25 minutes or until a toothpick or wood skewer thrust into the center of the cake and withdrawn is clean or only has dry crumbs attached. Remove both pans from the oven and allow them to site on a wire rack for five minutes. Run a knife along the circumference of each round to release the cake from the pan. Invert the pan over a wire rack. The cake should gently release and rest on the rack. Immediately remove the parchment paper from the bottom of the cake. Waiting until the cake begins to cool may result in some of the cake surface sticking to the paper and lifting off as you remove the paper. Allow the cake rounds to cool completely. Meanwhile, prepare a batch of heavy frosting such as a buttercream to frost the cake. 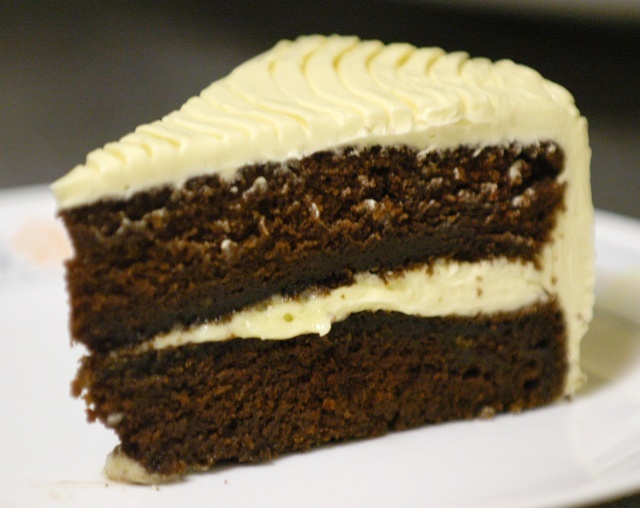 Once the cake layers have fully cooled, apply a little frosting to the middle of a cake cardboard, plate, or whatever surface you plan on constructing your cake. In these pictures, I built my cake directly onto a cake keeper. Place one of the cake layers onto the dollop of frosting. 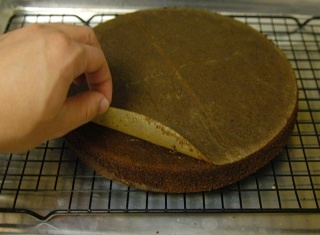 The frosting acts as mortar - keeping the cake from moving while we work with it. I like to place the layer topside down. This is because the bottom of the cake layer will be facing up and the next layer of cake will be placed bottom side down. 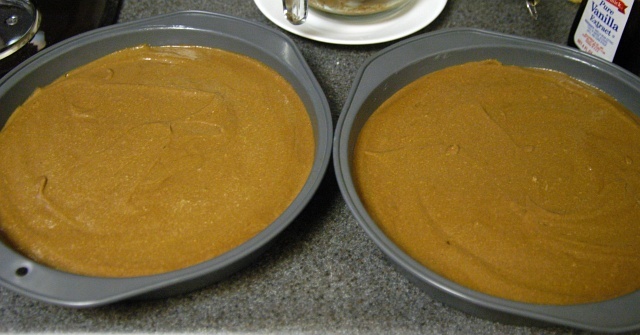 Since I use two identical cake pans, the dimensions of the bottoms of the cakes will always match. If the cake layers are not relatively flat, you can use a long serrated knife (like a bread knife) to cut any excess cake that might form a dome. Perform any cutting on the topside (the side resting on the wire rack). 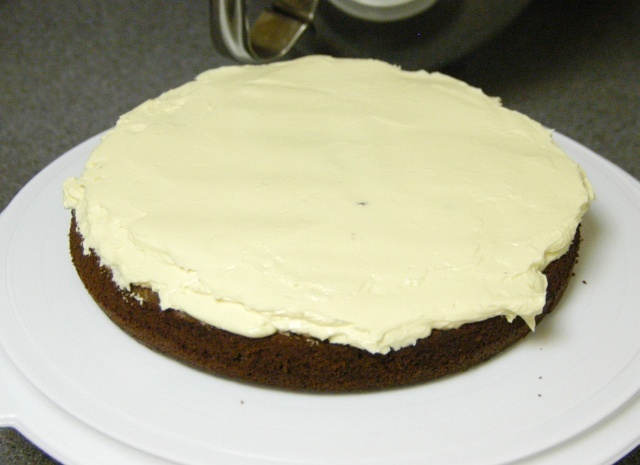 Place a sizable quantity of frosting onto the top of the cake layer (exact quantity will vary, but make sure you use less than half of your total frosting). Using an icing spatula or offset spatula, spread the frosting so it forms a flat layer. I find this easiest by holding the spatula so the edge is held at a 45° angle to the surface of the cake and the frosting is pushed out from the middle of the cake. I keep pushing the frosting out and rotating the platform that the cake is sitting on. 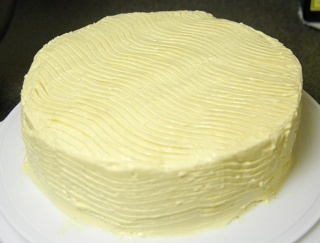 Lay the second layer of cake onto the leveled frosting. Be sure to match the face of the cakes (bottom down if the first cake layer was placed top down) so the diameters will match. Apply frosting evenly to the sides of the cake. Use the rest of the frosting to cover the top of the cake. At this point you can practice the art of cake decoration - of which I am not well practiced. 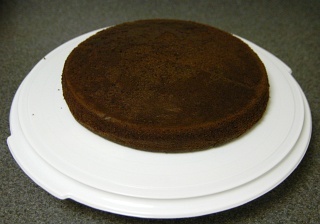 Despite the amateur appearance of the cake, the flavor of this cake can only be described as really chocolatey without any bitterness. The texture is halfway between crumbly and moist - dense but not heavy. Brown sugar is typically "packed" when baking, meaning you smash the sugar into the measuring cup and then add the "packed" sugar to the other ingredients. I noticed in the picture that the sugar was loose, which would result in using less sugar. Just curious as to what led you not to pack the sugar in this case. Thank-you! Brown sugar should always be packed when measuring by volume. (Just take a dry measuring cup and fill it with brown sugar, then push down on it with the back of a spoon to squeeze as much air out as possible and keep adding brown sugar in this manner until the surface is level with the dry measuring cup.) Alternatively, you can simply measure by mass. 1 cup packed brown sugar is 200 g.
When using dry ingredients, I typically use an electronic scale unless the volume of the ingredient is a tablespoon or less. This left the sugar loose (as shown in the picture). It also seems to integrate faster into the butter when loose than when packed, but after those few additional seconds it takes for the stand mixer to break the packed sugar apart does not make a difference to the recipe. Wouldnt this run the risk of seize when adding the water, or does that only happen to prepared chocolate? Don't worry about seizing. We're melting chocolate into the water (where water is the dominant ingredient). There is so much water in this recipe that the chocolate components (cocoa, sugar, fat) will be suspended in the boiled water. Seizing is an issue when moisture is introduced to chocolate that we're melting that we want to keep as solid chocolate later. It occurs because chocolate very dry (almost no water content) and the cocoa and sugar particles will have a strong affinity for any water that is introduced. When melting chocolate (for chocolate and confection making), if a tiny amount of water is introduced, entire portions of the chocolate will solidify as the cocoa and sugar mass clumps together (out of the fat). Seized chocolate can no longer be used for chocolate making, but can still be used for baking applications such as this cake. Alright, where do I get those bad boys? And where can I get a cake comb to get that swank wavy pattern? 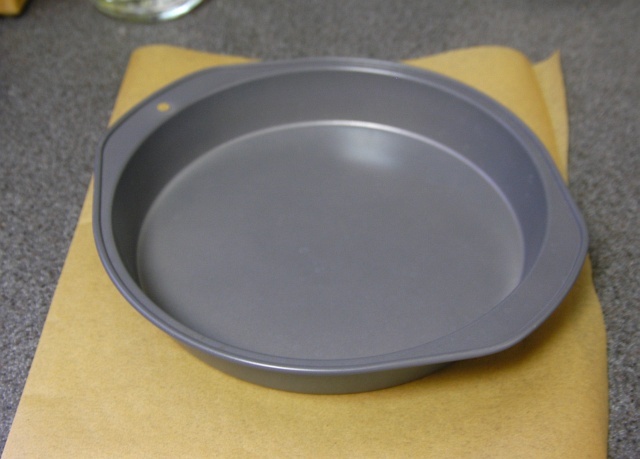 The first mention of the round cake pans in the article is a link to amazon.com where they can be purchased for about $4 each. The wavy pattern was achieved using a fork. I find it interesting that a mixture of cake and all-purpose flour is used instead of just cake flour. Do you think that the cake benefits from the extra gluten? I felt that with cake flour only, the texture was not as good (for a chocolate cake) as with the mix. All all-purpose flour felt a bit too heavy/dense for me. Your presentation is very interesting. I also like the step by step approach. I will visit again. I made this cake yesterday and we were very pleased with it. It is a very dark, moist cake. I guess the moistness is due in part to the dark brown sugar, the sour cream and the butter. I love dark brown sugar and use it instead of the light brown in any recipe that calls for brown sugar. It seems to give the baked good a better quality flavor. In a medium saucepan, melt the butter with the cocoa and the buttermilk. When melted, remove from the heat and add the vanilla and then start mixing in the powdered sugar. I used a little more than half of a 32 ounce bag last night. You want it to be oozy and liquidy as it will set up once it is refrigerated. When the sugar is mixed in well, add the pecans and pour it over your cake. Great stuff. When making a chocolate cake, I often substitute coffee when water is called for. I LOVE the combination of coffee and chocolate, and find the chocolate flavor is enhanced. The substitution I use is 1:1, with great results. Have you tried this substitution in your recipe? Love your web site and recipes, Michael! Keep up the great work! HELLO CAN YOU TELL WHETHER SCHARFFENBURGER 70% BITTERSWEET CHOCOLATE WOULD BE AN APPROPRIATE CHOCOLATE TO USE FOR THIS RECIPE? THANKS! I think a faster weigh (sorry couldn't help myself) is to know hte weight of your mixing bowl (in your case that looks like a Kitchen Aid mixer) - engrave it right on the side of the bowl if necessary. When you have finished mixing your batter weigh the mixing bowl subtract the intial weight and divide by the number of portions you need. That way (I restrained myself this time - aren't you glad) it doesn't matter whatn the pans etc you are filling weigh - just put one on thescale - zero it if you have an electronic one or just add the difference if you don't and fill to that amount. This saves the constant going back and forth between the pans to adjust the weight as you only need to deal with each pan once. The main reason I appreciate the dual measurements is that though I'm from America, I am living in China at the moment - and some things come with the grams marked right on the box (for instance, 125g and 227g butter - why not 225 or 250? I don't know...) I've found everything on the recipe with a few minor substitutions ('yoghurt' for sour cream, a dark chocolate bar for the chocolate), but I do not have parchment paper. I'm going to attempt it without - perhaps one layer with just greased, another with grease and flour, to compare - but for future reference, is there any decent substitute or any way to treat some other paper to make it serve the purpose? (I can't get brown paper bags here either for my favorite merengues to bake on, and sadly I've found that plain printer paper leaves a nasty taste) I do have aluminum foil - expensive!!! - but haven't yet come across any waxed or parchment paper. Also wondering if there's anything to do to keep the batter fresh between layers. The only ovens available here are toaster ovens, so I'll be baking my three layers one at a time. One last note: in the text it says to let the cake cool 5 minutes, but in the recipe at the bottom is says 15. I'm gonna guess 5 is right? They mark it 227 g because it was first measured in ounces (8 ounces) and then the value was converted to g and printed on the label. Usually, when an item is measured in g and then converted to ounces it is rounded to the nearest 1/4 ounce - so the 125 g package (if it had labeling in ounces) would probably have read 4-1/2 ounces. I've found everything on the recipe with a few minor substitutions ('yoghurt' for sour cream, a dark chocolate bar for the chocolate), but I do not have parchment paper. I'm going to attempt it without - perhaps one layer with just greased, another with grease and flour, to compare - but for future reference, is there any decent substitute or any way to treat some other paper to make it serve the purpose? Your best bet would be to grease the pan and sprinkle either flour (like you said) or chocolate powder (which would be best for this recipe because of the color) into the pan and get it to coat all the sides. Remember to knock out the excess powder. 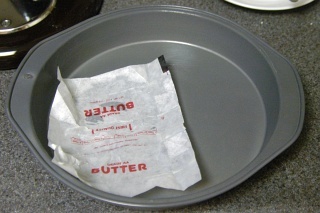 A sheet of plastic wrap, pressed up onto the surface of the batter should keep it from drying out. Good catch. I've fixed the typo. The only ovens available here are toaster ovens, so I'll be baking my three layers one at a time. I have a suggestion for this. It is something I usually use to speed things up. Instead of using 2 separate pans (or more) you can put everything in a deeper one. After it is baked and cooled enough you can cut it into as many layers as you need. You can use a knife of course, but I prefer a peace of thin thread (floss), it is more precise. Also, if you are not practised in this, for better precision it is better to move the cake than the thread. Tie one end of a thread to a needed height, take other end in your hand, tighten it up, don't move it and push the cake forward with your free hand. 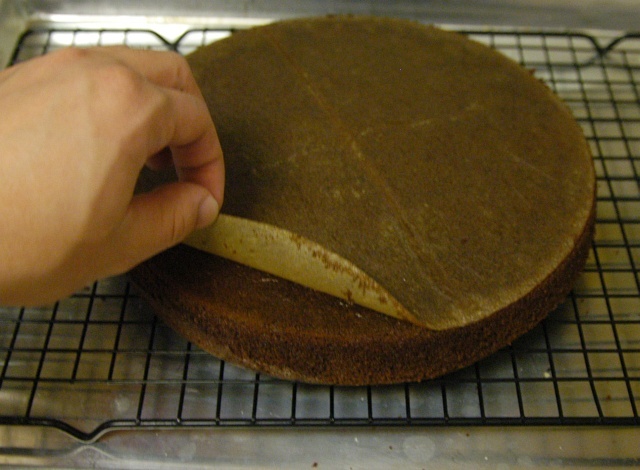 You may think that cake won't be baked well in the middle cause of the thickness, but don't worry. At least, I didn't have problems with that... yet :) . Thank you both for your advice and explainations! It did indeed come out better from the buttered-and-floured pan than the just-buttered, but the third layer was the best - I used the butter wrapper for parchment paper! I also discovered that the cake has a strong affinity for peanut butter (used to anchor it since I wasn't making frosting). Delish! And, one more way to divide it - I used my one-cup measure and just scooped the batter into the pan and into two smaller bowls to divide it into three (since I didn't know how much to put in the pan for the first layer). But then I had to eyeball it with a spoon for what was left over, so it's not nearly as exact as weighing. But I like that floss idea! I made this cake yesterday for guests and everyone loved it. I had a few problems with it however. The recipe states that the sour cream and vanilla should be mixed, but you did not state how much vanilla to use in the ingredients list (unless I am missing it). I opted for 1 tsp. I was very pleased with the parchment paper technique and utilizing the butter wrappers to grease the pans (genius!). My cake was extremely moist (which was a good thing) but when I went to invert the cake in order to frost it after allowing it to cool, it fell apart and I had to piece it together. Should I have allowed it cool longer? I didn't care for the buttercream frosting-almost too buttery of a taste but I will make this cake again with different frosting as it was delicious, moist and full of chocolate flavor. Thanks for the recipe--I love your site! I see you don�t say how to do the frosting. How do you do it? Subject: Baking a cake in NO time! I didn't believe it until my sister made cupcakes and gave me one to eat. It was one of the moist cakes I've ever eaten. You can make a cake with only 2 ingredients: cake mix and a 20 oz. bottle of diet soda! Just mix them together and bake! That's it! Of course, you need to coordinate colors (white cake = diet sprite/7up, etc.). I don't know why it has to be DIET, but I think it has to be. I bet that'll be an easy recipe to post! 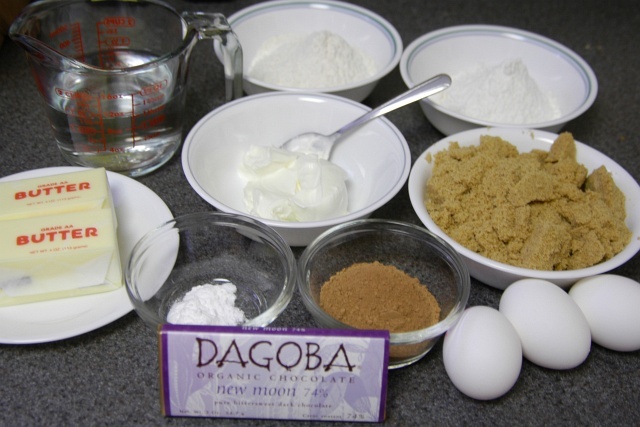 If you can please let me know where do I get the Dagoba chocolate and cacao powder. Where do you live? Dagoba Chocolate can be ordered directly from Dagoba at http://www.dagobachocolate.com. You can also find them at Whole Foods if you have one close to where you live. This tasted just like a thirty five dollar cake I can get in New York City which although tasty I had forsworn and vowed to make myself. I got 9 inch silicone pans on sale from Amazon to give this recipe another shot BUT I just caught an episode of Nigella Feasts on the Food Channel. Seeing as she made a chocolate loaf cake with sour cream, I tried that to see how it differed from your recipe. It was good and dense but more suitable to me because she threw all the ingredients into the food processor! The batter was much thicker than your recipe and much thicker than her batter on tv but it rose and cracked accordingly. I have two questions. The first one is, if I just take out the cacoa powder and the actual chocolate, could you use it as a regular white cake recipe? Next question, is it okay to use regular flour, or do you absolutely have to use cake flour? Thanks, it'll really help! The first one is, if I just take out the cacoa powder and the actual chocolate, could you use it as a regular white cake recipe? This is possible. I would replace the baking soda with about 2 teaspoons of baking powder though. Otherwise, the ingredients could work for a white/yellow cake. Next question, is it okay to use regular flour, or do you absolutely have to use cake flour? Thanks, it'll really help! You can use all-purpose flour, but cake flour will help make the texture crumbly (like a cake) while all-purpose will tend the cake to be closer to a muffin consistency. Where can I find the pure cacao powder? What are some other types of chocolate that can be used that are easier to find (or cheaper) than the Dagoba? Cacao powder can generally be found in the baking aisle of your supermarket. Some brands market it as cacao powder while others use the term cocoa powder. Usually the companies that sell it as cacao powder do so to emphasize that no unnecessary ingredients have been added (such as sweeteners). Scharffen Berger, Schokinag, and Valrhona all make excellent cocoa/cacao powders. Depending on the area you are in, it may be easier to find Ghiradelli or Guitard cocoa which is also very good. If all else fails, there's always Hershey. I've noticed that some chocolate cakes call for boiling water added to the batter... Why does the temperature of the water matter? And what is the best way of adding this boiling water to the batter without "scrambling" the raw eggs in it? It would be great is some science whiz could answer my questions! :)) This is a very informative site, btw! This recipe is for a cake every bit as good as cake made by a professional pastry chef. I'm not a big fan of buttercreme (you might as well eat spoonfuls of raw butter), but this cake could come from any premium bakery. cake/frosting recipe I have found. This tastes/looks/feels every bit as good as a cake from a Parisian bakery. If you want to impress someone- this is the recipe to do it with. It also made me realise I don't like proper Buttercream Frosting. You may as well as unpeel a stick of butter and eat it like a banana! Can you make this cake in a Bundt pan? What adjustments do you have to make to the recipe - baking time, etc? made this last night, and was setting up my mise around 9:00 and realized I didn't have any brown sugar (which is odd, I use it a lot), so I used 280 g of "sugar in the raw" + 20 g dark molasses. The flavor and texture of the finished product were outstanding although I was surprised at how thin the batter was while making it and was worried I didn't have enough flour or something. Also, your gram weight of sour cream in the intro is for a whole cup, I caught it when I was assembling becuase the correct weight is listed in the table, but I had gotten out the full amount, and had to re-measure before dumping it in. I ended up making cupcakes with an Italian buttercream instead of the american one listed because they were for a potluck and I wanted stability at room temp. They were a hit. This site is awesome. I'm a mechanical engineer myself and am always thinking analytically. I enjoyed the ingredient scheduler chart at the bottom of the recipe...reminds me of a Gantt Chart! I just tried this recipe, and it was my very first cake from scratch! Everyone LOVED it. Thanks for the awesome recipe!!!! More cake recipes please!!!!! How much vanilla extract do I use?! Thanks, I can't wait to make it!! 1 tsp. Sorry about that, it's listed in the recipe summary table at the bottom, but not in the exposition. I'll add it somewhere now. I am in LOVE with this cake! It's still moist four days after I've baked it! I added a teaspoon of instant espresso powder to the cocoa/chocolate mix to give the cake and extra kick of flavor. The next time I make this, I plan on decreasing the butter a tad bit to see if it will still retain a good amount of moisture. I was wondering why this recipe called only for baking soda and no baking powder. Would there be a difference if baking powder was also added in? I've made this cake multiple times for many different occasions now and everyone always loves it, so thank you! What do you mean when you state 70% dark chocolate? Does that mean the chocolate I use should be at least 70% cocoa? Yes, 70% cocoa or cacao content is what you're looking for. Dagoba carries a several varieties of chocolate ranging from 68% to 74% in blended and single origin. Any of these will be fine (and will have different flavors depending on which origin you select). I have made this recipe twice now. I am an absolute wreck of a baker, and for me to get any baking recipe right twice in a row is one heck of a compliment to your instructing ability! Thank you so much, Michael! As a side note - the baking time for standard sized cupcakes is almost exactly 15 minutes at 350F (tins filled 3/4 full did not rise as much as I wanted, so I went ahead and filled them all the way to much success). Also, I turned my cakes into German Chocolate cake using this disgustingly good recipe for coconut pecan frosting. Don't even bother looking if you're counting calories. throw the sugar, butter, vanilla, eggs, condensed milk, salt and cornstarch into a saucepan and stir constantly over medium heat for about 5 minutes or until everything is melted together and looking smooth. turn the heat up to med-high and stir constantly until flakes of brown begin to appear as the sugar caramelizes along the bottom of the pan. I haven't burned it yet, just keep stirring and pay attention. When you have a pretty brown tinge to the whole mix, turn off the heat, throw in the coconut and pecans, stir it up a bit more and pour warm over your cake or cupcakes. yum! 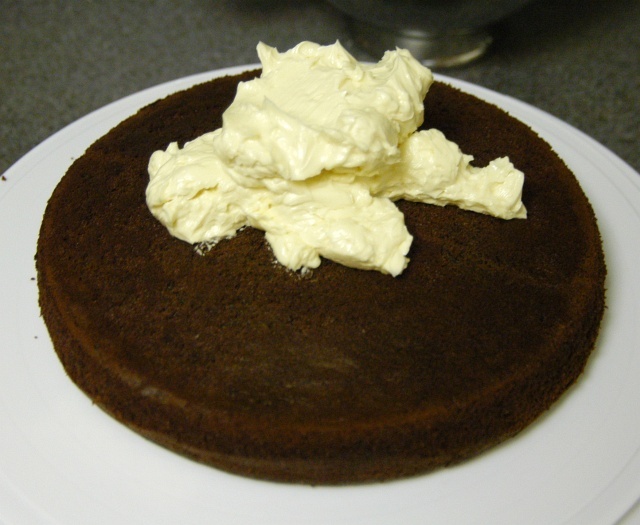 cake flour = self raising flour, why do you need sour cream? Another question what is buttermilk in other recipe? well, "plain flour" is not a defined term. but, "all purpose" is probably not far from whatever definition you are thinking about. flours are classified by their protein aka gluten content. hard aka "bread" flour has higher gluten - gluten makes for an elastic dough that holds the bubbles that the yeast burps out. self rising is two turns unrelated to any of the above; although it is typically "all purpose." self-rising contains pre-mixed leavening - usually baking powder - and a dash of salt. why do you need sour cream? well, baking powder and baking soda are both base compounds. 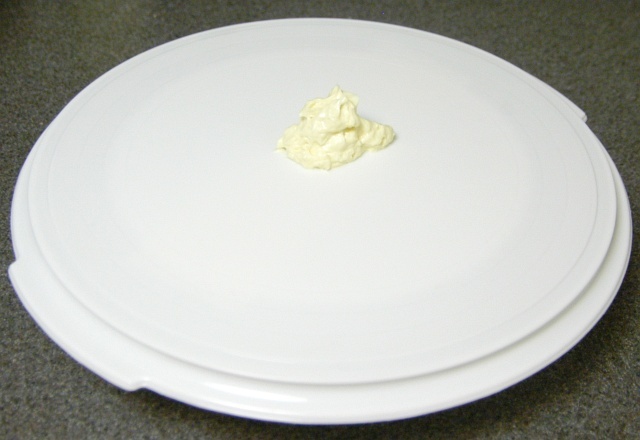 mixed with acids - sour cream, buttermilk, and a ton of "others" - that combination produces a chemical reaction which releases co2 which makes for bubbles which get labeled "leavening"
Creme fraiche? Yogurt? Non-fat or whole? yes, yes, either. <g> watch the batter consistency - it may be slightly looser - you may need a bit more flour and/or bake time adjustments. keep in mind, when you alter a baking recipe, you will probably get slightly different results. some people take their chocolate cake real serious! and a little or this or that is used to modify consistency, crumb, moistness, etc. kindly tell me , as i really need to know this, i do not have a conventional oven but a microwave convection grill oven. pls tell me how i can cook the same recipe in my microwave convection grill oven. pls do reply. and pls give clear instructions. apparently you have some kind of "combination" oven? microwave - I have never attempted to microwave cook a cake. there are microwave recipes for chocolate cake on the web - but I suspect the ingredients are different to accommodate the microwave method. grill: grilling a cake is not something I would recommend. convection: does the oven have the ability to set a baking temperature? 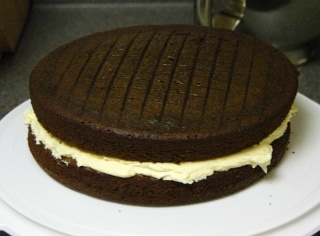 and check on the cake more frequently for doneness - don't just go by the clock. well, about the technical specifiactions, i have a Samsung C103FL , (CONV+MICRO+GRILL) . It has output power of 100W/900 W-6 levels ( IEC-705), The microwave power consumption is 1400 W, GRILL 1300 W , CONV 1700 W, if that helps. about baking temp setting , in the convection mode the micowave gives me 220 deg c, 180, 160, and other lesser options. there is a micro+convection mode as well. "The convection mode enables you to cook food in the same way as in a traditional oven...."
so, select the convection mode, set the temperature, bake the cake - seems simple enough, no? ok, maybe thw writer of this recipe will have a better idea about how exactly to go about with the cake in the microwave. I tried your cheesecake recipe, and it's heavenly good. Tonight, I will bring it over for my mother-in-law. Thank you so much for the detail recipe. I have a question. If I am only using an thick 8 inches pan to bake the chocolate cake (usually bake with sponge cake), do you think i have to bake a longer? like an hour or more? Forgot the sour cream, but still came out moist and incredibly delicious! We used Michael's buttercream frosting recipe as well. Try with raspberries on the top and around the base for a great compliment. do you notice the dark line that forms at the bottom of the first layer and the top of the second layer (i am guessing you flipped the bottom layer so the top of the cake was at the bottom of the bottom layer - right?). 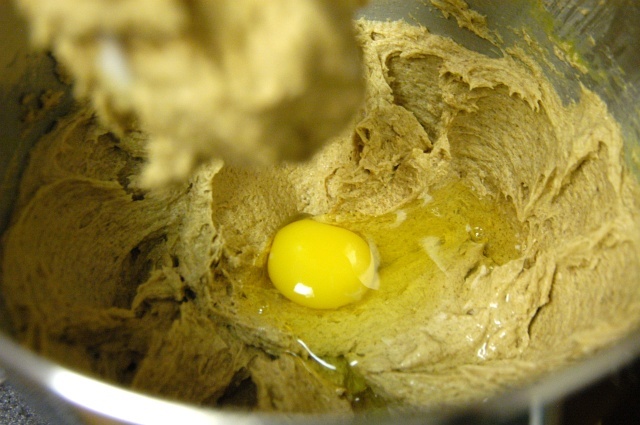 To prevent that from happening and to get a fluffier and slightly lighter cake, do not let the butter soften or the eggs come too much to room temperature. Let the butter be slightly cold still and start to cream the butter and sugar, you will be surprised with the difference it makes. Cream the butter (cut in into 1 inch cubes when slightly cold) and sugar for about 10-15 minutes, seems like alot but try it and you'll see. There are (at least) two ways to make a more level cake without having to lose some of the finished product. The first is to leave a divet in the middle of the batter before putting it in the oven, and the second is to weigh down your layers before assembling them into your finished cake (with a small cake a heavy cutting board is enough, with something the size of the bottom of a wedding cake, use some weights on the board). I find most butter icing/frosting too sweet, so I add the juice of half a large lemon when mixing it. I also decide on my top cake (the flatter of the two!) and spread what will be its inside (lower) side with a tart jam like apricot - not wholefruit, just nicely spreadable to a uniform depth. Then I spread the upper layer of my bottom cake with butter icing, sandwich them together and put the rest of the butter icing on top. Everyone I know enjoys this method. I used dutched cocoa for this cake recipe [much easier to find than natural cocoa where I live] despite the fact that it is supposedly not acidic enough for leavening like baking soda [which requires an acid to work]. The result was excellent - light texture with sufficient rise. Perhaps the chocolate provided enough acid or the dutched cocoa is still somewhat acidic? Cooks Illustrated once tried both dutched cocoa and natural [nonalkalinized] cocoa in various recipes with baking soda & baking powder; their results were usually better flavor with dutched cocoa and no less rise than natural cocoa with all the baking soda recipes. So I would recommend trying this recipe with dutched cocoa and see which type you prefer. You need not be cautious about it. Chocolate cake is my all time favourite.Chocolate cake is made with chocolate or it can be made with other ingredients, also. These ingredients include fudge, vanilla creme, and other sweeteners.These adds taste and good flavour to the cake and make it more delightful..